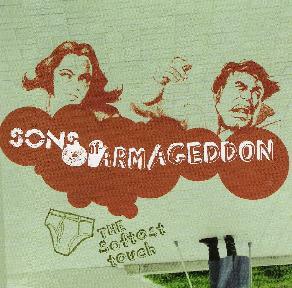 Sons Of Armegeddon - "The Softest Touch"
The Colorado based six-piece Sons of Armageddon describe their music as "post-apocalyptic electro-jazz for the pre-apocalyptic listener". I'm not sure about the pre/post-apocalyptic thing, but electro-jazz is an apt description. Though it's so much more than that, so let's go with the apocalyptic thing. Why not? Blending live bass and percussion with trancey electronics, turntables, samples, trumpet, guitar and even Theremin, The Sons groove to their own rhythms in a wild and freaky blend of acid jazz and trip hop. Think Kind of Blue Miles Davis meets some weird 1950's sci-fi movie soundtrack set to hip hop, reggae, latin and dub rhythms, and you'll start to get an idea of what these guys sound like. Now throw in a little industrial noise, some Eastern vocal samples and everything else including the kitchen sink, and... well, you kind of have to listen to them to get it. My only criticism is that after awhile, with its relentless mid-tempo offerings and basic (but very cool) formula (trancey rhythm + samples + quirky electronics + plus trumpet soloing), it starts to sound a bit the same. But rather than that making it boring, it just kind of lets it float into the background a little. Still, it's definitely an enjoyable trip, whether you're listening to it right up front, or letting it just become part of the environment. For more information you can visit the Sons Of Armegeddon web site at: http://www.soag.net.